Frying bacon on the stove top yields crunchy bacon, but it can also result in a greasy mess all over your kitchen. By slow cooking bacon in the oven, you can not only keep the splattering bacon grease contained, but you can also cook perfectly crisp bacon with minimal effort. Cooking bacon in the oven is a slower process than cooking bacon in a frying pan, but the ease of cooking and cleanup can be well worth the extra time. Line a large, rimmed baking sheet with parchment paper or aluminum foil. Place the bacon strips on the lined baking sheet, being careful not to overlap any of the bacon. Place the bacon in the heated oven and cook until the bacon is golden and crispy, about 25 to 30 minutes. Rotate the entire pan 180 degrees in your oven halfway through the cooking time to promote even cooking. 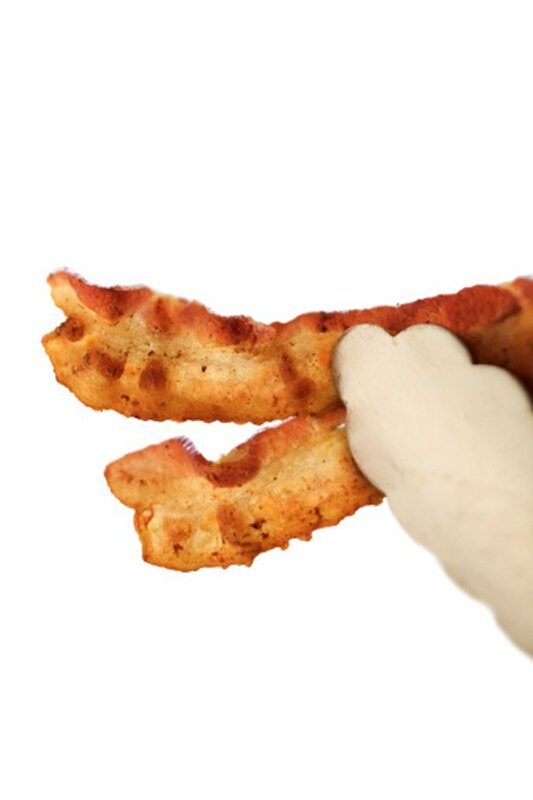 Use tongs to place the cooked bacon strips on a plate lined with paper towels. Let the bacon drain for a minute before serving. For easy cleanup, pull the foil or parchment out of the pan, and throw it and all of the bacon grease in the trash together.